Choose H2PAD for new installation systems and for replacements in existing poultry and swine cool cell systems. Manufactured with strict quality control to assure long life in the toughest conditions. 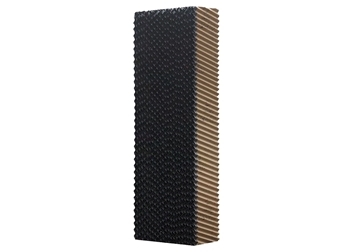 Standard pad configuration is 6" thick by 12" wide, featuring 15/45 fluting and a 3/4" ProTech coating on one side to resist damage from UV light and mechanical cleaning processes. Available in standard height options between 24” and 72”. Additional sizes and configurations available by special order. 2" ProTec bottom coating available in certain markets. Contact us for more information about sizing options and TRUCKLOAD pricing! Click here to learn more about the materials we construct our H2Pad out of and the strict manufacturing process that is used to build our high-quality cool cell pads.